Wait; what? Where did January go? February means we’re still knee-deep in Winter… but already walking out it! 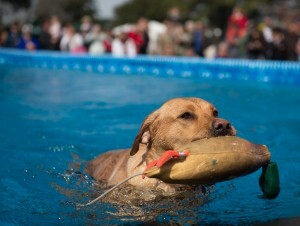 In Charleston, the second month of the year brings weather mood swings, from balmy afternoons watching the Dock Dogs during the Southeastern Wildlife Exposition… to chilly evenings around a bonfire, cracking open hot, succulent, and salty oysters and anointing them with Texas Pete or another hot sauce of your choice(we’re big fans of Crystal!). The Rodney in Exile Tour: In November of last year, Pitmaster Extraordinaire Rodney Scott lost his cookhouse to fire in the tiny town of Hemingway. This story might have stayed in South Carolina, but the Southern Foodways Alliance, itself a keeper of the flames of Southern cooking traditions, came upon Scott’s Bar-B-Que a few years back and rightfully brought attention to this outpost of pork. Scott’s Bar-B-Que has been doing things the old-fashioned way since 1972, when Rodney was 1 year old and his parents opened a convenience store, smoking a hog or two each weekend because it seemed like a good thing to do. The whole hog barbecue caught on, though, and soon became the store’s primary draw. All grown up, Scott runs the show now, with the help of family and friends, of course. Which brings us back to the Southern Foodways Alliance and its web of influence. When news of the fire at Scott’s Bar-B-Que spread late last year, the Southern food community rallied around Scott. A loose confederation of mostly Southern chefs and farmers and food lovers called the Fatback Collective brought many of its members together to put on the “Rodney in Exile BBQ Tour.” The tour features Scott and his barbecue traveling to pit stops all around the South to cook with supporters and friends. The point of all this is mainly to raise funds to help rebuild the barbecue pits at Scott’s, but the tour is also a chance to spread the gospel of whole hog, to share the love of smoked pork done in a way that is all too rare these days. Participating Chefs include Chad Billings(Southerly at Southern Season), Laird Boles(Salt at Station 22), Brannon Florie(The Granary), Stephen Thompson(Prohibition), Dan Doyle(Poogan’s Porch), Cole Poolaw(Barsa), Jonathan Kaldas(The Meeting Room), John Zucker(Cru), John Ondo(Cafe Lana), John Robertson(Kitchen 208), Justin Morris(The Bistro at 125 Calhoun), and Brian Parkhurst(Ted’s Butcherblock). Distilleries represented will be Old Pappy van Winkle, Hudson Whiskey, Firefly Distillery, High West Distillery, Bulleit Bourbon, George Dickel, Virgil Kaine, Dark Corner Distillery, Six & Twenty Distillery, Striped Pig Distillery, Clyde May’s, Nelson’s Greenbrier, Crown Royal, Voodoo, Old Forester, Woodford Reserve, Masterson’s, and 1792 Ridgemont Reserve. Arlo Guthrie at the North Charleston Performing Arts Center: For the past year Arlo Guthrie has been touring solo in celebration of his father Woody Guthrie’s centennial. Arlo continues to honor the elder Guthrie’s remarkable legacy with a series of live shows accompanied by a small band for a spirited musical tribute by a son for his father. The “Here Come The Kids Tour” will have an emphasis on the best-loved songs and stories the Guthrie family closely associate with the distinguished patriarch. The Southeastern Wildlife Exposition: SEWE is a three-day showcase of everything we love about wildlife and nature. It brings together people of all ages, men and women, sportsmen and conservationists, artists and artisans, fans and families. Through an incredible lineup of events – from fine art exhibits, conservation education, sporting demonstrations and parties, SEWE invites us all to explore our “wild” side and pay tribute to our naturally beautiful world. SEWE was established in 1982; the first Exposition was in February 1983. Since then, SEWE has grown from 100 exhibitors and 5,000 attendees to the largest event of its kind in the nation. Today, an average of 40,000 attendees come to see more than 500 artists, exhibitors and wildlife experts from around the world. Brewvival: Presented by COAST Brewing Co. and The Charleston Beer Exchange, the highest quality and most unique beers from the best breweries in the country will be available for your sampling pleasure at this all-day celebration.